The new SC3700 Quiet Clean® Canister vacuum from Sanitaire features a wide assortment of accessories for bare floor, carpet and detail cleaning. Built for commercial facilities such as hospitals, hotels and office buildings, the SC3700 is lightweight yet durable, operates quietly for day or night cleaning, and features premium filtration to help improve indoor air. 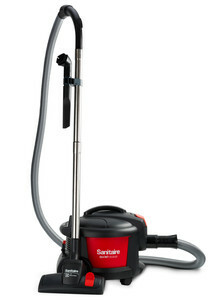 The all new Sanitaire SC3700 Quiet Clean Vacuum is designed as a commercial canister vacuum. This is the perfect vacuum for any commercial application such as hotels, motels, preschools, restaurants, maid services, office buildings and even hospitals and so many other venues. The Sanitaire SC3700 is equipped with a powerful 9 amp 1000 watt commercial motor providing maximum suction power for a deep clean. Weighing in at only 14.4 lbs. the SC3700 is light weight and easy to maneuver around furniture and obstacles. Quiet operation ranking in at less than 68 decibels makes the all new SC3700 canister vacuum perfect for any day or evening cleaning duties. Our proven canister is compact, powerful, and features metal extension wands, crevice tool, and dusting brush to reach those difficult cleaning locations. Perfect for detail cleaning.